Tastings - Cocktails, Cheese Pairings and More! Earlier this month, cider makers across the nation (and even some from other countries – Canada, the United Kingdom, and elsewhere!) gathered in Chicago for the 5th Annual CiderCon. Over the five years the conference has taken place, the hard cider industry has not only grown immensely but so has the number of cider producers in the United States resulting in an increased attendance at CiderCon each year. 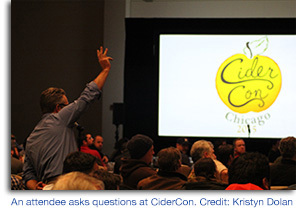 The very first CiderCon was hosted in Salem, Oregon in 2011 and had a mere 45 people in attendance. In 2012, that number doubled to 85 people when the conference was moved to Chicago, Illinois. This year, over 680 attendees roamed the halls of the Swissotel Chicago representing over 353 cideries and 36 states – the most from Michigan, New York, Washington and Oregon. 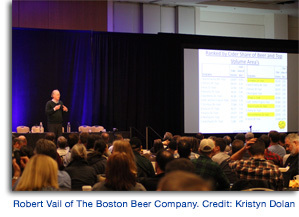 This growth in the number of producers mirror images the growth that Robert Vail, Director of Allied Brands, at The Boston Beer Company discussed in this opening remarks. According to information Vail gathered from the Beer Institute, TTB (Alcohol and Tobacco Tax and Trade Bureau) and Commerce Department in 2014, there was a 68.3% growth in volume of cider produced versus the yearly average in 2014 – the second largest change in volume growth over a six year period. Further, from information reported by IRI, the western region of the United States experienced a 64.7% growth in cider from last year alone, the largest of all regions. This makes sense considering Los Angeles, CA represented the largest market for hard cider in the country (second was Seattle/Tacoma, Washington and third was Portland, Oregon). However, cider in the mid-America region experienced the largest growth within the craft beer industry of 20.7%. Hard cider now makes up 18% of craft beer sales across the United States! In fact, if it were a craft beer style, it would be the second best-selling style. All of this information demonstrates only one thing, more people are drinking hard cider. More specifically, six times – the number of cider drinkers has grown six times in the past two years; and 75% of existing drinkers drink more cider than a year ago. 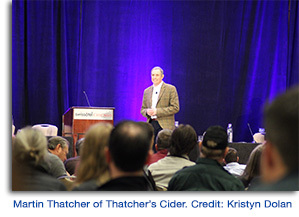 CiderCon wasn’t just about statistics though, special guests joined conference goers for breakfast and lunch including Martin Thatcher of Thatcher’s Cider and the United Kingdom National Association of Cider Makers who told us about the growth of Thatcher’s Cider. Thatcher shared a very interesting and staggering fact with us: Thatcher’s Cider sells more in a day than the company did in a year 15 years ago – WOW! 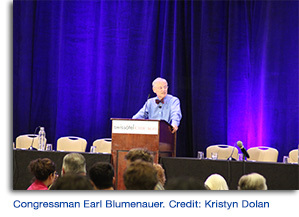 Congressman Earl Blumenauer from Oregon’s 3rd District was also a guest speaker at the conference. Congressman Blumenauer has always been a huge supporter of the hard cider industry. At the conference, he discussed the bipartisan Cider Industry Deserves Equal Regulation (CIDER) Act, HR 600, that he has reintroduced with Congressman Chris Collins from New York’s 27th District. The CIDER Act would amend the section of the tax code that deals with wine and related beverages, 26 USC 5041, to support the growing number of craft and entrepreneurial cider makers, and tailor IRS rules to reflect variations in craft ciders across the country. This piece of legislation is very important since a variety of factors can lead to small changes in the composition of a cider’s alcohol content and carbonation during the fermentation process. Because of the narrow way that hard cider is currently defined in the tax code, these small variations can lead to cider being taxed at a rate fifteen times higher than what the statute clearly intended. The Blumenauer-Collins bill would update the tax definitions to greatly reduce the chance that improper taxation could occur. The bill would also broaden the definition to include both apple ciders and perries. These changes would better reflect the industry and keep American cider competitive in the international marketplace. A wide variety of other discussions took place on CIDER Act in the tradeshow where attendees could get sample letters to send their representatives urging them to support the bill in both the house and the senate. Attendees could also get action packs that explained what the act is in easy-to-understand terms and why the United States Association of Cider Makers is requesting this change be made to federal law. Please visit CiderAssociation.org to gain access to information on CIDER Act and take action. Also at the tradeshow, conference goers had access to over 30 different booths with products to help them with cider making or get their business off the ground. Hard Cider News found its good friends at Fruitsmart who have been kind supporters of the e-newsletter for the last two years. The conference covered a wide array of learning and tasting sessions on the business of cider making, orcharding, marketing, sales and more. 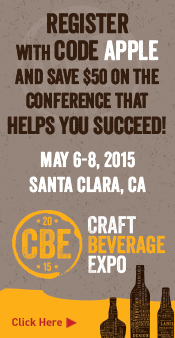 Learn about some in our other articles as part of this special edition newsletter on CiderCon! Although learning about the industry Hard Cider News covers is very important, the best part of CiderCon was meeting the very people the newsletter covers throughout the year and putting faces with names. During the welcome reception and cider share, attendees were able to try ciders from across the nation and talk about the ciders one-on-one with the cider producer. 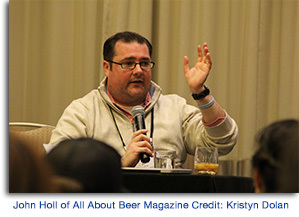 Further, during “outside CiderCon” events at local restaurants and bars, conference attendees – like Hard Cider News – were able to take in the Windy City while still supporting hard cider at dinner and drinks. For karaoke fans, the Emporium Arcade Bar opened the stage to singers (good and bad) and had 12 dedicated tap lines to cider. Fountainhead, opening Chicago’s first cider bar – The Northman, held a cider tap takeover with Ace, Etienne Dupont, Farnum Hill, Original Sin, Tieton Cider Works, Vander Mill, Uncle John’s, and Wandering Aengus. 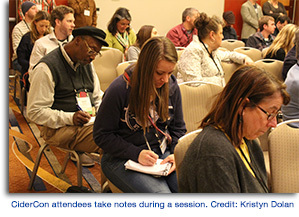 CiderCon attendees that followed the business track of the conference had the opportunity to learn about the legal, accounting, and tax aspects of cider production in addition to contract cider making and labeling and marketing. One interesting session covered the topic of tasting rooms - with over 70% of cider producers on the east coast operating tasting rooms, learning Strategies for a Profitable Tasting Room was an important session. 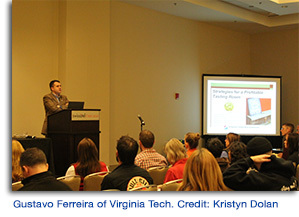 Gustavo Ferreira, Assistant Professor & Extension Economist at Virginia Tech, taught attendees of this session about establishing a tasting room, signage and room design, selling, pricing, and payment strategies, and hiring tasting room staff. Since Hard Cider News caters to both the cider maker and the consumer, this was a very informative session on why certain tasting rooms may operate the way they do (i.e. offer/not offer food, have/not have tours, etc.). The session began with a discussion on regulations to consider when operating a tasting room like permits and what you can/can’t do according to state, town and village laws. Did you ever think “I wish they had a tour” when you visited a cidery? Well, maybe a tour isn’t offered because the cidery has increased costs like additional staff, liability insurance, and landscaping to consider. The conversation continued on tasting rooms with proper signage and design– where to place signs for consumers to find the location easily (advance directional signs, entrance signs, etc. ), branding, space concerns, handicap access, etc. 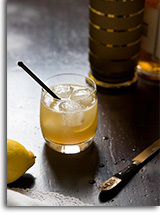 Attendees learned that 18-inch wide tables are the most ideal for tasting and serving bars should not exceed 24-inches. Additionally, companies with tasting rooms should strongly consider having free wireless for guests so that on-the-spot social media reviews and testimonials through posts, photos and videos are encouraged. The most informative part of this session though was the different strategies that Ferreira suggested cideries take a look at to maximize profits for growth. For example, if a cidery charges its customers a tasting fee, maybe they should consider reimbursing the fee if the customer makes a purchase of cider. This establishes good business with the customer and typically encourages additional purchases. It was also interesting to learn that according to the Wine Business Surveys of 2012 and 2013, formal seated tastings led to higher average sales per customer ($172) in comparison to those conducted standing at the bar ($78) or casually seated at the bar ($95). Lastly, Ferreira strongly emphasized that hiring the right tasting room staff is pivotal to the success of the tasting room since customers rate their experience by the friendliness, courteousness, knowledge, professionalism, and service of staff. 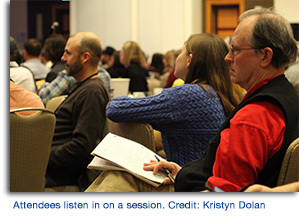 Cider makers had the opportunity at CiderCon to learn how they can sell more cider at sales and marketing sessions that covered distribution, on-premise cider perspectives, off-premise cider perspectives, sales strategies and tactics, and managing press. As the market grows for hard cider, on top of making a good cider you also need to be a good sales representative for your cider. 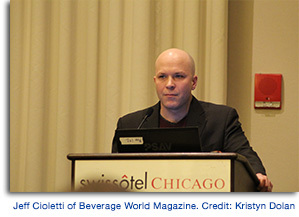 Since Hard Cider News is a form of media, the From Press to Press: Getting Media Coverage for your Cider Brand topic presented by Jeff Cioletti of Beverage World Magazine and John Holl of All About Beer Magazine was found to be a very informative session. Hard Cider News fields a ton of inquiries about hard cider – everything from where to find a certain cider, equipment recommendations, and statistics on the market to distribution notices, product launches, and start-up announcements. Getting these inquiries is fantastic because it allows the staff of Hard Cider News to interact with its readers but also cover the hard cider industry to provide the information that is being sought after or share the information provided. 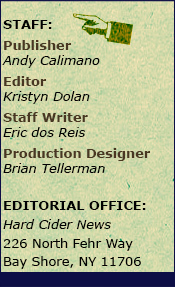 However, it is often difficult to cover certain articles or topics in Hard Cider News without information. Cioletti and Holl did an excellent job of letting attendees know some great tips for working with the press. For example, send photos with your press release and emails for inclusion since most articles and posts will always include a photo of sorts. 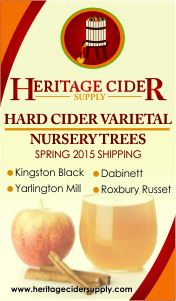 Even radio stations that may not be able to show the cider when speaking about it will post photos to websites later. The best tips were about writing press releases though. Not everyone knows how to write a press release for a variety of reasons (maybe you never learned how to, maybe you never needed to) but press releases are key to getting the word out about your brand and product. Cioletti and Holl could have probably done a whole workshop on how to write a press release based on the questions they fielded from the audience but they hit the basics and these days Google can find anything. Cioletti and Holl also discussed how to know you are working with a valid media outlet which is very important since today there are millions upon millions of blogs – some just starting, some developing, and some with huge readerships. The two presenters said to look at the media’s following or ask for it. Check if the media source has a social network. Also take a look at the most recent post, issue, article, etc. ; has the media outlet been active? Lastly, don’t forget to make sure the particular media outlet is appropriate for your product. This may be common sense but sometimes members of the media come to cider producers for information and samples so it’s important to ask questions and learn about who you will be talking to and working with. The most valuable piece of information Cioletti and Hall mentioned though is to be available. Cider makers have 101 things to think about between making the cider and selling it but if you aren’t available to speak with the press or to provide the missing logo or photo, chances are you won’t be covered. Many times, when members of the press contact you it is also last minute and when they need a response that day or even that hour to go live or to print. Therefore, if you plan to send a press release, plan to be near your email or phone the next couple of hours for questions. One more piece of advice, don’t send your press release at the end of the day because your email will be buried by morning and you want to assume normal business hours for those questions that may be asked. Conference goers of CiderCon had the ability to sit in on over 10 different sessions that discussed everything from ciderhouse equipment, stabilization, yeast, tannins, polyphenols, and fermentation. If you were a first-time attendee of the conference and just starting your professional cidermaking these sessions were immensely helpful. Hard Cider News found the Hop Around the Block session presented by John Metta of Maeve Cider in Hood River, Oregon very interesting since hopped ciders are becoming more readily available on the market. In New York (where Hard Cider News calls home), one of the most popular hop ciders talked about is Doc’s Draft Dry Hopped Hard Cider which is sometimes available “wet-hopped” at the Warwick Valley Winery & Distillery when it is in season. In Metta’s session, he covered a bit about hops in general (their history, qualities, and some hop varietals) but dove deeper into the discussion on what hops can add to flavor profiles of ciders and ways to get hop character into ciders. Did you know that compared to beer where hops may be added into the boil for flavoring and during fermentation for aroma, most ciders are exclusively dry-hopped? It makes sense why – most hard cider is not boiled. For those of you who may not know what dry-hopping is, it is when hops are added to the cider during fermentation to soak in the cider before bottling. 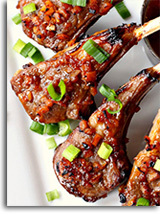 They will create some flavor but ultimately a ton of aroma. Time, temperature and the amount of hops will all create varied flavor and aroma profiles for the cider. There were five different hop ciders that the audience was able to try during the session. The first was a dry-hopped cider using Nugget and Fuggal hops which are common hops used in beer not cider. Metta purposely kept this cider unbalanced and soaked the hops for only seven days (usually he would soak them longer) to demonstrate the high resin and tannins in hops. Attendees could easily smell the hop character in the aroma with floral and citrus notes. After tasting the cider, there was a less noticeable hop character but you could feel how the tannins lingered on the tongue as bitterness. Metta has been playing around with “brewing” cider (as in boiling cider) for about 10 years. He introduced a bitter hopped cider commercially at Fox-Tail Cider in 2013 and it was the highest grossing cider the company sold. Metta believes that in 5-10 years most cideries will have brew kettles to make cider by boiling since he has found that brewing cider adds balancing characteristics to low-malic juice blends (especially if you are back-sweetening). However, the reason cider isn’t usually boiled is because pectin develops (which makes a hazy beverage) and carmelization can take place, among other things. Metta explained the bitter-hopping technique that he uses to better explain to the audience this brewing of cider. First, he only boils with 1/4 or 1/3 of raw juice and the boil lasts for only an hour with the use of bitter hops at this time. He adds enough hops so that the IBU (International Bittering Units – measuring unit for bitterness) will still be the level you desire after diluting the raw juice. After, he strains the hops off the juice (and squeezes them but this is Metta’s personal technique) and then adds the boiled, hopped juice to cold, raw juice. Metta then continues making the rest of the hard cider as he normally would with more filtering and perhaps fining later on. After learning the process of bitter-hopping, attendees were then able to try the same base blend of juice as in the first cider tried with Zeus, Mosaic and Simcoe hops added during the boil, plus Hallertau and Cascade hops later. These hops all have high alpha acids so they yield more IBUs. However, Metta used a neutral yeast to demonstrate what hops alone will do in bittering so the result was a funky (on the nose), grassy, tannic cider with a lingering bitterness not offset by positive flavors. In a third sample, using the same hops as the second sample but French white wine yeast, attendees tasted a cider that was a bit more fruity (like white grape qualities) with less resin and tannin qualities but bitterness that was a bit harsh on the tongue. The fourth sample was made with Belgian Saison yeast (also used at the commercially made Fox-Tail hopped cider) this cider resulted in tropical and citrus fruit notes in both the aroma and the flavor. There was a taste of dried apricot on the tongue and the bitterness seemed to be the most balanced. Metta explained this balance may be more perceived from the sweetness coming through than actual balance. In the final sample, Metta introduced another way to create a hop cider – by infusions or extracts. Attendees tasted La Fleur from Hood Valley Hard Cider which was created with hop extract. There was no perceptible bitterness but a good nose of hops. For conference goers that not only make hard cider but grow apples or farmers that are looking to grow apples specifically for hard cider makers, there were a number of CiderCon sessions that covered the types of apples to grow, designing and establishing a cider orchard, pest management, and comprehensive approaches to growing apples in certain regions. Neil Macdonald of Orchard Groundcare in Somerset, United Kingdom spoke to attendees about English Cider Apples & Orchard Systems which was very informative considering the United Kingdom is one of the top regions for cider making and consumption. As of 2012, the United Kingdom accounted for 47% of global cider production equaling 1.5 billion pints! He also shared different orcharding systems that one could use. Attendees discussed rootstock, planting, management, and harvesting systems as well. CiderCon attendees had the opportunity to sign-up for several tastings that took place throughout the conference. 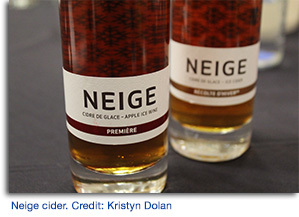 Fortunately, Hard Cider News was able to sit in on most of these including Apple Ice Wine – Ice Cider presented by Francois Pouliot of La Face Cachee de la Pomme which produces the brand Neige ice cider. Pouliot developed the concept of ice cider about 20 years ago and has continued to craft his cider making techniques. Over time, Neige has taken home over 113 awards (63 of which were gold). Premiere – This 2011 vintage was made mostly with McIntosh apples. It had 170g of residual sugar and 12% ABV. This ice cider is typically the first made of the season since these apples are picked in October/November. Therefore, Premiere is considered an autumn harvest cider. 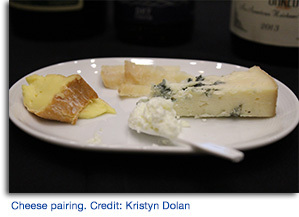 Many attendees found that the Farnum Hill cider actually paired better with the Etude and the Bayley Hazen Blue cheese paired with all ciders well. Other tastings at CiderCon included Cider Mixology which conference goers were introduced to three cocktails made with cider including a punch, a redesigned Old Fashioned and a Dark & Stormy; and Same Juice, Different Ciders where several cider makers shared what they have done with Farnum Hill juice to make very different hard ciders.